Now that Spring is finally here, it’s time to think about outdoor parties and BBQs. We have a pool so I am sure we are going to do some entertaining. It’s my favorite time of year. I have been trying to think of some good BBQ dishes. First thing I came up with was the Pineapple Mango Salsa. Now I am giving you potato salad. 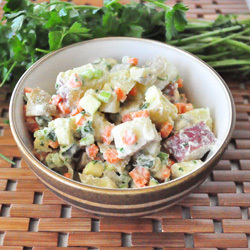 This potato salad is dairy free as well as vegan. I know there are lots of kids these days with dairy allergies, mine included. This recipe is for them. It is pretty darn tasty too. For the mayo base, I used my Dairy Free Ranch Dressing. In a pan, boil the potatoes to soften them. About 10-15 minutes. Mix all the ingredients in one bowl. Makes about 3-4 servings. Enjoy! Oooh! Great idea! I absolutely loved the Dairy Free Ranch Dressing....I was so pleasantly surprised at the flavor and texture. To use it for potato salad is genius! Can't wait to try it:) Thanks again for your great recipes! What is the orange in the pic? Carrots weren't in the recipe but maybe unintentionally omitted? Yes, they are carrots! My husbands jotted this recipe down and I guess he forgot to add the carrot. :) I just corrected that. It is 1 carrot diced. Wow! That was tasty! I've tried several non-dairy creamy sauces and that was the best one. And we loved it with this potato salad. Thank you for your recipes! I can't wait to try more.